Thunderclouds rolled into the Japanese beach town of Uchinada early one December morning in 2015. The scientists expected the storms; they'd staked out the location specifically for studying something normally only seen by satellites. Sometime after 5am, a flash of lightning struck a wind turbine. And along came a more perplexing weather phenomenon, too: The thunderstorm turned into a particle accelerator and blasted gamma radiation at the ground. A team in the United States and Japan led by then-graduate student Gregory Bowers observed these gamma-ray flashes with special particle detectors. Satellites have observed gamma-ray flashes before, but this latest flash was unusual in several aspects, and it came with a prize: They observed a burst of subatomic particles (in this case, neutrons) in their detector. Their observations could shed light on what exactly causes gamma ray flashes and what causes lightning in general, and help researchers get a better handle on how the electric fields inside thunderheads behave. 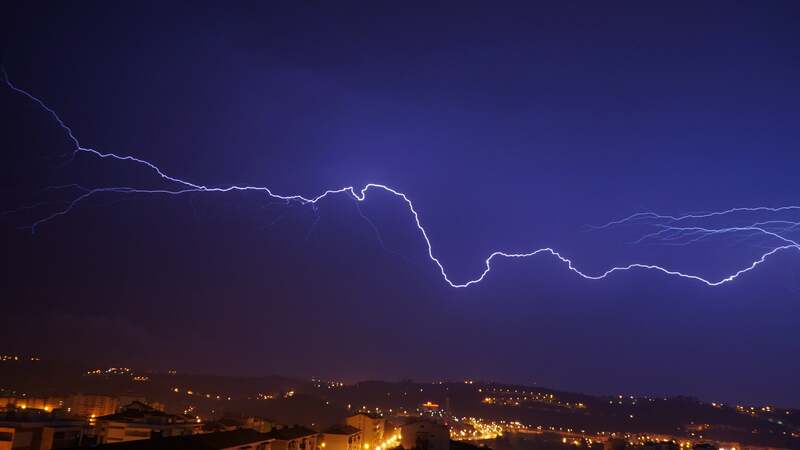 "We really don't understand how thunderstorms make lightning very well," study author Joseph Dwyer from the University of New Hampshire told Gizmodo. "How it gets started inside the cloud involves how strong the electric fields are. If you get clues to what the electric fields are doing by seeing the gamma rays coming out, that gives you an idea as to what's going on." Scientists have observed so-called "terrestrial gamma ray flashes" shooting upwards from the Earth into satellites since the early 1990s. But the 2015 flash was special. Not only did it in shoot down into the ground instead of up into space, but it confirmed a long-standing suspicion about these flashes by sending a barrage of neutrons into particle detectors a thousand feet away, according to the paper published yesterday in Geophysical Research Letters. Also, the flash was huge. "The total fluence of gamma-rays at the ground was calculated to be approximately ~100,000 photons/cm2 , much larger than the total combined fluence of all TGFs observed by satellites since 1994," according to the paper. "This is one of the brightest gamma-ray flashes ever seen on the ground," Dwyer said. As to what's going on, there are still some ambiguities. Perhaps the lightning itself is directly responsible for the gamma-ray flashes. Or maybe the electric field inside of the thundercloud begins to accelerate particles, like a particle physics experiment. The interactions in the clouds could have created positrons, a kind of antimatter (yes, this has happened before). When positrons interact with their regular matter counterpart, in this case electrons, they turn into light particles, called photons, which would show up as gamma rays. The neutrons add another layer of intrigue: Researchers had predicted powerful emission of neutrons from these flashes, but no one had ever observed them before. They think that high-energy gamma rays interacted with nitrogen in the atmosphere, leading to the production of neutrons. The thunderstorm may literally have become a nuclear reactor, where energy and elements cause reactions in the sky that produce radiation. All of this is to say that our Earth is really weird, and thunderstorms can turn into natural particle-accelerating nuclear reactors for reasons we don't quite understand yet. But no, you don't need to worry about the radiation. "You'd probably get more radiation having your tooth x-rayed" than being hit by the neutrons from one of these blasts, said Dwyer. Maybe the dose would be higher for pilots flying around inside the storm, but "This is not my highest concern if I ended up inside a thunderstorm," he said. "There are a half-dozen ways a thunderstorm can kill you if you're inside."